Shirts With Random Triangles: Adrian Peterson stands behind Johnny Manziel. 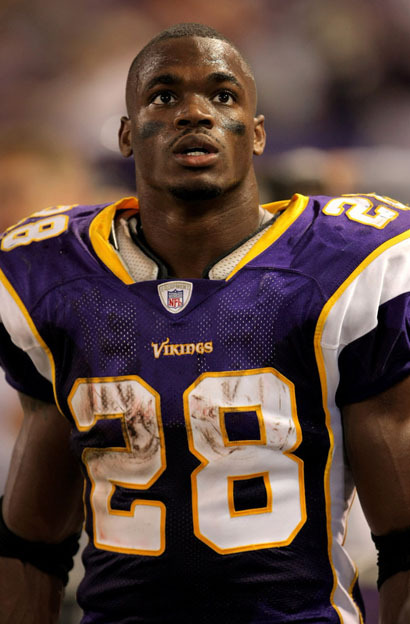 Minnesota Vikings' running back Adrian Peterson had a few things to say about the controversy surrounding the NCAA investigation of Texas A&M starting quarterback Johnny Manziel, and whether or not he accepted money for signing sports memorabilia. To wit, Peterson supports the idea that college athletes should be able to profit off of their on-the-field success. “I think if you are in a position to where people want to pay you for your autographs or signatures, then you should be able to do that. He’s a young man and he should be able to sign his name on a helmet or wherever without it being an issue." So you can add Peterson to the long list of people smarter than the NCAA.